You were listed as the lead historian on this interesting programme which was shown here, 6 December 2007, Channel 4. Queen Victoria. In fact, as I am sure you know, George V and Tsar Nicholas were cousins, with an astonishing likeness, because their mothers were sisters, daughters of the King of Denmark. It was the Tsarina who was a first cousin of George V, Kaiser William and Charles Edward, Duke of Albany, because her mother was a daughter of Queen Victoria and therefore a sibling of Edward VII, The Empress Frederick, and The Duke of Albany. The false cousinship is mentioned so often in popular histories that people will begin to believe it. Many of the consultants on the programme should have picked up this mistake. reference was a trivial point in the story of Charles Edward but a careless description can cast doubt on the veracity of other facts. And, in the same way, the fact that Charles Edward found himself Duke of Coburg must have been incomprehensible to anyone who did not already know that Victoria's husband, Prince Albert, was heir to his childless brother, the Duke. When Albert died in 1861 the Prince of Wales waived his right to inherit Coburg and passed the succession rights to his younger brothers. I think this could have been explained, however briefly. Nevertheless the programme had a lot to recommend it. Thank you. Thank you for your thoughtful and well-informed note. I believe you are correct on all counts. If I may, I'll pass on your comments to the filmmakers. Can you please tell me more about the Duke of Coburg? Thanks! Brian writes: Sorry: this is a blog, not an information service! I suggest that you try Google and Wikipedia, and your local library. Another historical correction I’m afraid… Charles Edward was not the youngest of Queen Victoria’s grandchildren. He was born in 1884, but his father’s younger sister Beatrice (Queen Victoria’s youngest child) had four children (Alexander, Ena, Leopold and Maurice) all of whom were born after Charles Edward, between 1886 and 1891. 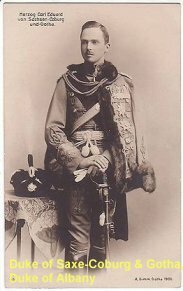 This makes Prince Maurice the youngest of Queen Victoria’s grandchilden.